Retailer: Meijer Inc., of Grand Rapids, Mich. Hazard: Pedals on the bicycles can loosen or detach during use, posing a fall hazard to the rider. Incidents/Injuries: There are 29 reports of pedals detaching or coming loose during use, including 16 reports of minor injuries. 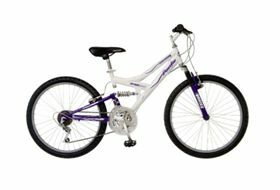 Description: This recall involves two-wheeled youth and adult Huffy, Iron Horse, Mongoose, Northwoods, Pacific, Razor, and Schwinn bicycles measuring 20″ or more. They were assembled on-site at Meijer stores by Serv-U-Success of Grandville, Mich. The bicycles were sold between March 2012 and August 2012 and have a Serv-U-Success assembly sticker attached. This recall does not include bicycles with Serv-U-Success assembly stickers written in green marker. The Serv-U-Success assembly sticker is located on the bottom of the bicycle frame between the pedals or on the back of the frame facing the rear tire. A full list of affected models can be found on Meijer's website at http://www4.meijer.com/recall/bikebooklet.pdf. Sold exclusively at: Meijer stores in Michigan, Ohio, Illinois, Indiana and Kentucky from March 2012 through August 2012 for between $60 to $300. Bicycles sold at Michigan Meijer stores in Cadillac, Gaylord, Petosky and Traverse City are not included in this recall. Remedy: Consumers should immediately stop using the recalled bicycles and return them to any Meijer store for a full refund or a replacement bicycle of the same type and value. Consumers will also receive a $10 store coupon. Consumer Contact: For additional information, contact Meijer at (800) 927-8699 anytime, or visit the firm's website at www.meijer.com where a link to recalls can be found at the bottom of the homepage.